South Korea, the US and other concerned parties are discussing temporary sanctions exemptions for a joint railway field survey with North Korea, a Unification Ministry official said Thursday. The two Koreas are “behind schedule” in implementing their plans to modernize and reconnect cross-border railways after the US-led United Nations Command declined South Korea’s proposal to test-run its train across the border in August, citing procedural problems. Dramatic progress on the project, which was the subject of a clause in the agreement reached by the leaders of both Koreas in April, has yet to take place. The official added that the schedule will be finalized after discussion of relevant matters with North Korea. Regarding the railway project, Seoul’s Foreign Ministry said the allies still needed to discuss a “small technical issue,” without revealing details, stressing that the US has expressed its “wholehearted” support for the project at the latest working group meeting in Washington. “(Lee’s) explanation is correct,” Cheong Wa Dae Spokesperson Kim Eui-kyeom said during a regular press briefing. 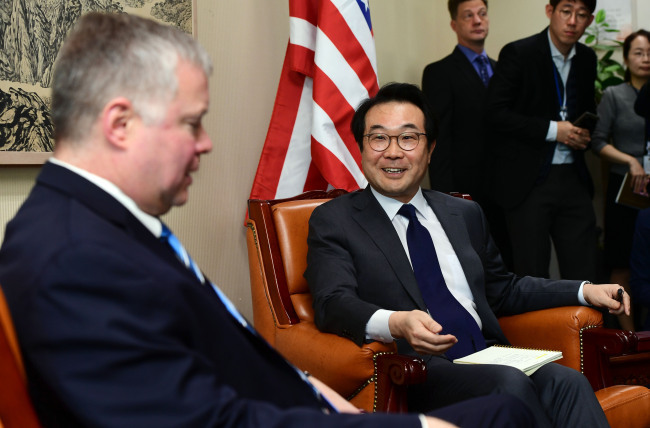 Lee’s remark came after he attended the inaugural meeting of a South Korea-US working group with his counterpart Stephen Biegun, the US Special Representative for North Korea. However, skepticism continues to surround Lee’s remarks, as US Secretary of State Mike Pompeo said earlier Wednesday that Washington had “made clear” to South Korea that the progress of the North’s denuclearization should not be outpaced by that of efforts to improve inter-Korean relations. Instead of addressing the doubts directly, the Cheong Wa Dae spokesman merely said the presidential office understood Pompeo’s statement as a call for the two allies to “maintain close coordination.” Pompeo meant that US-North Korea ties should “accelerate” and also should produce equally impressive results as inter-Korean relations, Kim added. The schedule surrounding the railway project has been pushed back since August on the back of what seemed to be Washington’s concerns that inter-Korean relations were making faster progress than the denuclearization talks. There was also a perception that the test-run of a train across the border could provide a way to deliver materials and equipment that might undermine UN resolutions on North Korea. The Koreas’ initial plan was to start a field survey in late October so that they could hold a groundbreaking ceremony for the project either in late November or early December. Seoul now aims to hold the groundbreaking ceremony before the end of the year. The inter-Korean project aims to modernize railways that run along the west and east coasts of the Korean Peninsula, the Gyeongui Line and the Donghae Line. It is viewed by many as a project that could lay a foundation for further inter-Korean economic cooperation, once layers of sanctions against North Korea are lifted.